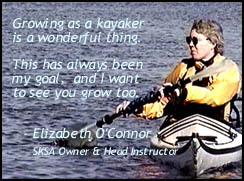 Sea Kayaking Skills and Adventures, Ltd.
We're here to provide for your paddling needs: Keep in mind that we paddle year round. We have the longest days (and the most class time) in the summer, but water temperatures are excellent from June through October with minimal gear. Off season classes, from November through May, demand specialty gear due to colder water temperatures - call us for advice. We have designed specific programs with the beginning, intermediate and advanced paddler in mind. But we understand everyone has specific needs. We are prepared to meet you practically anywhere on Long Island for private lessons or custom tours. Time and travel rates apply outside our new Connecticut base area, but group discounts are also available - call us for a quote. To sign up for any scheduled program program, please follow the instructions under "Class Registration" below. Land Mail (US Postal Service): will reach us at the following address. Contact by phone: Your special needs and concerns, your schedule, our schedule all are better discussed on a phone call than by any other method. A phone call is the most efficient method to communicate. You can reach us at the number below. If we are on the water, please leave a detailed message, with your contact information and best time to get in touch. We will never contact you unnecessarily. Registration forms in PDF format are available for download below. When you know the class you want, registration will verify your interest and prepare us to serve you. A 50% deposit is required to reserve your place in the class or event of your choice. If the class is full or if we are forced to cancel we will make a full refund of your payment. Otherwise note our cancellation/refund policy on the registration form. Please forward the registration form via form-mail (active form) or email (Static form) as soon as possible. Follow up by mailing a copy along with the required waivers and your deposit (check) by land mail at least one week or more before the class. Complete one registration for each participant. If you are part of a group, add your organization in the name field. Be sure to include your ACA membership number if you have one. Please include your home phone number so we can contact you as we set up the class. Be sure to include your e-mail address - this is how we communicate if we are out of office. Important! Include a cell phone to contact you for last minute changes of venue or with directions if you get lost. NOTE:If you need boat or gear rental contact us by phone immediately to verify we have equipment to fit your needs. Download our waiver: each participant must read and complete one. Forward with your down payment or bring to the class. Students under 18 years of age must complete a Youth Waiver which is co-signed by a parent or legal guardian. Students 15 years of age and under must be accompanied by an adult who is also taking the class. Students under 8 years of age typically require specialty gear and instruction methods, contact us before you register younger students. Information Policy: We keep your contact information confidential and do not share it outside our company. We will not contact you except as needed to prepare for a class or event without your permission. About Liability Waivers: Liability waivers are a fact of life for those in the outdoor field and you will encounter them frequently. Please take the time to read our waver carefully before signing. Students under the age of 18 must complete the "Youth" waiver which is co-signed by parent or legal guardian. Our waivers inform you of the potential risks and dangers inherent in paddle sports. We take great care to insure safety during our classes and work to prepare our students to handle a range of situations. Please recognize that our classes take place in a natural environment many aspects of which are unpredictable - especially weather and other boaters. Part of training is learning to build awareness of potential risks and work in advance to mitigate them. PLAN TO HAVE FUN SAFELY! Late Registration: students registering less than one week in advance of a class should contact us directly by phone and follow-up via email. We will advise you the best way to register for the class. SKSA Web Mail Form: to contact us via web mail please use the form below. Note that our form requires you to enter either your first or last name and either a phone number or an email address in order to operate. We would prefer that you supply both email and phone so that we can be sure we can answer your question. The list of topics is for your convenience and completion is optional. We will respond to you as quickly as possible and provide you with an e-mail address for further communication. About me (us):Unless you have a boat and gear, please provide your physical data (age, height, weight) to help us in tailoring rental equipment and training to your needs. Also please provide your paddling experience, prior training and let us know if you have any special requirements or conditions that may affect your training safety. Message: Specific requests or interests. Challenge us to serve you better. Natural environments are inherently uncontrolled and difficult to predict - this is part of their charm. We approach skills training from the standpoint of SAFETY FIRST and FUN second. Sound training helps us understand, accept and learn to handle the risks we encounter on the water which enhances our enjoyment. We inform our adult clients about the potential risks of paddling on our Waiver form which must be read carefully and signed before participation. Juniors must have a minor waiver completed by a parent or legal guardian. Adults are encouraged to stay and watch young adult classes and are expected to participate in youth classes. Who can participate in SKSA classes? Anyone who has a desire to learn how to paddle, is capable of being safe on the water, and is physically able to perform the tasks can join our classes. Some classes are structured toward training adults, others toward training youth and still others toward families. Each group is most successful when taught with a different style. If you have questions regarding the appropriateness of a specific class we encourage you to ask us in advance. Please also advise is in advance if you or your child have special needs. What if I tip over? Tipping is likely and even encouraged. We are practiced at getting people back in their boat with a minimum of effort. Kayaks, SUPs and even canoes are easily capsized by the novice who does not yet understand balance and stability and even by the expert attempting advanced maneuvers. But remember, sea kayaks and canoes were designed by native people who used them to hunt dangerous creatures in arctic waters with great success. Like riding a bike, paddle craft are stable once we understand their dynamics, relax, and let the boat do its job. One of our first goals is to help you learn to be comfortable capsizing, exiting and getting back into your boat. Once accomplished, learning to avoid capsize while using the boat to your best advantage is easier and eventually becomes second nature. No, we do not require that our students be able to swim because all participants will wear Type-III (sport type) life vests (PFDs) that aid in flotation. At a minimum, participants must be able to right themselves and hold their body face up in water that is over their head while wearing a PFD. Must I wear a Life Vest? Absolutely, all students are required to follow the "WEAR IT" rule because paddling is serious fun! We require each participant to wear a properly sized and fitted USCG approved Type-III personal flotation device (PFD) at all times while on or near the water. It is required by law that you wear such a vest when paddling in the off season and and have one within reach during the summer. We know this is insufficient: that donning a PFD while floating in the water is nearly impossible and one not worn is easily lost in a capsize. We wear our PFDs at all times, even when training in a pool so that we are practiced with it on. You will learn more about this during our classes. Will we be getting wet? A capsize is likely when practicing new skills, so plan on getting wet! We encourage all participants to become comfortable getting in and out of their boats. Most of our clients will practice a wet exit during their first class. During Recovery classes we will be capsizing on purpose several times. Please plan to wear quick drying clothing (no cotton) and water shoes or old sneakers. Please do not wear flip-flops or open sided sandals. Bring a towel and a change of clothing for after the class. Plan to secure glasses, hats, and other items dear to you in case of a capsize and leave non-waterproof electronic devices on shore. Will we cancel if the weather forecast is "chancy"? Generally, no. All forecasts err on the side of caution. A 40% chance of rain means a 60% chance of good weather. We use weather forecasts to plan our gear and prepare backup plans but seldom trust them for cancellations. Exceptions include active weather emergency alerts in our local area - make sure we can contact you by cell with last minute changes. We generally monitor conditions during class and are prepared to react if necessary. Do we cancel if it is actually raining? Usually, no. We expect to get wet during classes anyway, so expect classes to run regardless of rain, but plan your gear accordingly (or ask us for advice). We will notify you in advance if extreme weather (i.e. heavy wind) causes us to reschedule or relocate the launch site for a class - be sure we have your cell number. We may put out briefly, delay or cancel a class for threat of lighting. Do I need my own boat and gear to take a class? We encourage students to take lessons using their own craft and equipment, except for pool classes where space is limited. However, we can usually provide boats, paddles, life vests and appropriate safety equipment (though our canoe and SUP fleets are limited). Please let us know if you will need a boat or gear in order to participate in a class. What personal items do I need to bring? Head Protection: paddling helmet for surf or whitewater classes, neoprene hood in winter. Swim Protection: a USCG type-III life vest (PFD), properly fitted and worn at all times on the water (advise us if you need a rental). * When water temp is less than 60F or air + water temp is less than 120F then protective clothing must be worn. These conditions usually occur in late Fall, Winter and into late Spring (October through May). Consult us if you have questions. **Please advise us if you or a minor may require help in administering personal medicine. Let us know of any condition which may impair your ability to function coherently and safely in support of yourself and others. Do I need to bring anything else? Interest to learn an exciting new sport! Please contact us directly by phone of email. See above for details. © Copyright 2017 by Changing Tides Paddle Craft, LL. All rights reserved.